Tags: Book, Crash Course, Prosper, Prosper! Our earlier book The Crash Course (Wiley, 2011) detailed how current global trends are bleak: weak economic growth, too much debt, declining incomes for the lower 99%, a dangerous addiction to fossil fuels, and accelerating ecological destruction – just to name a few. Many of us understandably feel resigned to an eroding standard of living in the years to come. At best. It addresses head-on the most common question we hear: Given the future trends forecasted in The Crash Course, what should I do? A LOT of work went into this book, which we've crafted to speak to a wide audience. If you're looking to introduce new minds to the material discussed here at Peak Prosperity, as well as guide them to take prudent action, Prosper! is the single best resource to hand them. "How does one thrive in -- let alone survive -- a world filled with unsustainable debt, overconsumption, and rampant cronyism? The authors of Prosper! put forth the best vision I've yet seen." “Of those trying to decode the gathering fiasco of finance and economy, Martenson and Taggart get my vote as the smartest guys in the room. Their writing is lucid, wise, funny, and wide-ranging, and this book is indispensible if you want to come out the other side of this crisis in one piece." "I couldn't put Prosper! down. Whether you think things are getting better or getting worse, legacy living is the way to thrive, and this book tells you how to do it. Everyone needs to read Prosper!" "Clearly, our global addiction to debt-fueled growth will not end well. 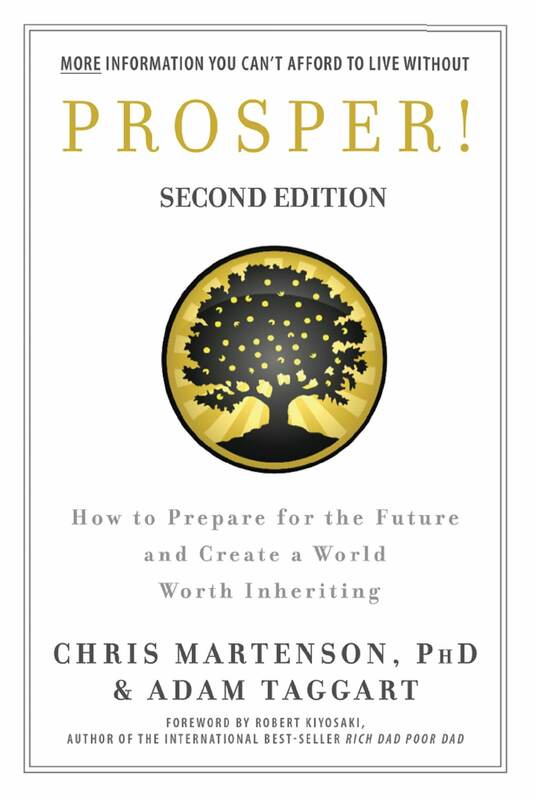 In Prosper!, Martenson and Taggart provide a rare and much-needed resource for today's times: a comprehensive guide detailing the steps you should take now, in advance of crisis, to secure a bright future." We're quite proud of this book as we think it represents some of our best work to date. And we think its timing couldn't be better. We're seeing accelerating signs everywhere that the "recovery" engineered since 2009 is failing, as also are key systems in the natural world that we depend on. Folks who follow the guidance in this book now, in advance, will be much better off when the next crisis hits. So how can you get your hands on Prosper!? Because we know that many of you have specific preferences, we pushed very hard to have the book available in print, e-book and audio form at launch. Each of these versions hit bookstores everywhere this month and can be purchased right now. Being fully transparent, our preference is for you to purchase the print book through Peak Prosperity, as the economics are much more favorable to us and will help greatly in recouping the book's development and publication costs and -- if the book sells well -- fund further improvements to PeakProsperity.com. As an added incentive, we autograph each print book purchased from us. The print book can also be purchased through Amazon and at nearly any other major bookstore. Those of you who prefer to listen to books while out gardening, exercising, etc, you're in luck! We have an audio version of Prosper! narrated by Chris himself. It's available now for download on Audible.com, on iTunes, as well as on other sites like Audiobooks.com. It will also be available on CD soon, which you can pre-order on Amazon, Barnes & Noble, and at many other online booksellers. And for those who enjoy reading their books on a Kindle or other e-reader device, an e-book version of Prosper! is also now available for the Kindle, Nook and other popular e-reader devices. Prosper! is the product of years worth of scouting, researching, trialing and evaluating a wide spectrum of resilience-building practices -- all done on behalf of, and in participation with, our wonderful community of readers here at Peak Prosperity. The book itself was proofed by a brave cohort of PP.com readers and many improvements were made based on their feedback. A number of other readers kindly submitted their own personal stories of inspiration, which are peppered throughout Prosper! 's pages. In our eyes, this work is as much a product of your contributions as it is ours. And we think it's a hell of a valuable resource. We hope you'll read it and use it yourself, as well as share it widely with those you care about. Who knows? Maybe this is the spark that focuses the public's consciousness on the serious predicaments we face...one that offers reality-based strategies and answers, while also delivering a much-needed vision for hope. We've been laying the groundwork for the better part of this year to get Prosper! in the hands of as many people as possible. Your help in that mission will be invaluable, and greatly appreciated. The next twenty years will be completely unlike the last twenty years. The world is in economic crisis, and there are no easy fixes to our predicament. Unsustainable trends in the economy, energy, and the environment have finally caught up with us and are converging on a very narrow window of time—the "Twenty-Teens." The Crash Course presents our predicament and illuminates the path ahead, so you can face the coming disruptions and thrive--without fearing the future or retreating into denial. In this book you will find solid facts and grounded reasoning presented in a calm, positive, non-partisan manner. Our money system places impossible demands upon a finite world. Exponentially rising levels of debt, based on assumptions of future economic growth to fund repayment, will shudder to a halt and then reverse. Unfortunately, our financial system does not operate in reverse. The consequences of massive deleveraging will be severe. Oil is essential for economic growth. The reality of dwindling oil supplies is now internationally recognized, yet virtually no developed nations have a Plan B. The economic risks to individuals, companies, and countries are varied and enormous. Best-case, living standards will drop steadily worldwide. Worst-case, systemic financial crises will toss the world into jarring chaos. This book is written for those who are motivated to learn about the root causes of our predicaments, protect themselves and their families, mitigate risks as much as possible, and control what effects they can. With challenge comes opportunity, and The Crash Course offers a positive vision for how to reshape our lives to be more balanced, resilient, and sustainable. For those of you who prefer the feel of vellum (er, pulp, or whatever books today are made of) in your hands, you can order the book on Amazon, purchase at Barnes & Noble, or ask for it at your local bookstore. If you own an e-reader, it's simple to purchase and download the digital book version of The Crash Course: The Unsustainable Future of Our Economy, Energy and Environment. Here are links for the Kindle, Nook, and other e-readers (including desktops and smartphones). Chris is also available to take orders for those who want their own personalized, signed copy of this first edition. For a site donation of $36, Chris will sign a hardcover copy with whatever personal dedication you instruct and we'll ship it anywhere in the US. Interested readers should email us so that we can provide payment instructions and co-ordinate the signing with Chris as well as the shipping. Please allow several weeks for delivery. Requests for shipments outside of the US will be priced on a country-specific basis. In fact, the majority of workers would chose a different career path if given the chance. The reasons span a wide range. Some simply experience a bad fit with the career that fate steered them into. For readers of PeakProsperity.com, there are often additional fears that their expertise will have little relevance to a future shaped by the “Three E” forces outlined in the Crash Course. But the reality is, most people don't take the steps to find a more meaningful path. The potential life upheaval and uncertainty that can come with a full-scale career transition often prove too daunting and overwhelming for most folks. And so they resign themselves to a future of lowered expectations. Of enduring their job. It doesn't have to be that way for you. Perhaps the most frequent question asked by visitors to the Peak Prosperity website is What should I do? "Work" is a huge part of #3. It occupies a large percentage of our waking hours and is often an equally large component of our self-identity. When our work is out of alignment with our passions, our natural abilities, or our values, it's nearly impossible to be content – and for good reason. To bring things into alignment, a process of self-discovery is necessary. Big existential questions like Who am I? What do I value? What are my strengths? What fulfills me? need to be faced head-on, and articulated in detail. This is a very tall order, and, not surprisingly, these are challenging answers for most people to resolve on their own. But these insights are absolutely essential for transitioning successfully to work you'll love, because they'll define the requirements a job will need to have in order to be a "great fit" for you. So, based on the many continual requests we receive from readers wanting clarity and instruction on how best to undertake such a big endeavor, we've developed a guide to the career transition process. It's called Finding Your Way to Your Authentic Career, and it's just been published. This book is a step-by-step manual for a tested process that yields the self-discovery, visioning, planning, and implementation that ultimately results in finding professional fulfillment. It has been analyzed for decades and is well understood by competent career counselors and coaches. Its overall message is: Your purpose is out there waiting for you. There is a methodical process to find it and to transition successfully over to it. Physical copies of the book are available for $15 at Amazon.com or through the CreateSpace store. Those with Kindles or iPads can download e-book versions for $9.95. (other e-book readers should be supported within 90 days). And if you're an Amazon Prime member, you can borrow the book for free on your Kindle. Each Stage has a progression of Steps comprised of specific exercises and practices for you to follow, as well as experienced advice to improve your odds of success. There’s little about this process that is novel or complex. It doesn’t require you to spend a lot of money. It doesn’t require you to go through any special training beforehand. The challenge lies in both having the courage to wrestle with yourself, as well as the reserve to see this journey through to its conclusion. But if you do, the odds of you ending up with a clear understanding of your “purpose” – and in a job that’s consistent with it – are very good. Probable, even. I can say this with confidence because I relied on much of the methodology within this book for my own career transition, from dissatisfied Silicon Valley executive to rural homesteader and proud co-founder of PeakProsperity.com. For those interested, I provide a glimpse into my personal story here. During and after my journey, I spent many hours talking with seasoned career coaches and career management experts to identify the key success factors for finding one's "authentic work" and securing employment in that field. Many of those factors are discussed in this podcast with the most helpful expert I encountered in this process. I encourage those considering a career change to listen to it. Another important lesson I learned was the value support networks lend. Other people in the midst of their own career transition are a fantastic (and free) source of emotional support, best practices, employer insights, and job leads. As a helpful resource, we've created the Finding Your Authentic Career Group for you to tap the collective nurturing of others who on the same journey as you. Doing work you love is a critical component of your financial and emotional resiliency. A career that energizes you, plays to your natural strengths, and gives you purpose is highly likely one that you'll excel in. And that outperformance will give you options you can leverage within an organization that recognizes your value. Or by enabling you to strike out on your own; to be your own employer. But even if the financial returns aren't as high as you'd like, the self-respect and fulfillment that comes from doing work you believe in will almost always make up for it. In coming posts, we plan to delve more directly into the importance of Work in a future defined by constrained economic growth and growing resource scarcity. If there are specific topics you'd like us to cover, please let me know in the Comments below. Adam Taggart's new book, "Transitioning Into Purpose," is a terrific guide for anyone struggling to figure out not only what their ideal career is, but also how to get there. He walks the reader through a thorough, carefully constructed process full of helpful strategies and tips. I highly recommend it. Adam Taggart shares the personal story of his own career exploration and discovery, while offering practical advice based on the lessons he learned from embarking on that transformational journey. Millions of people have traded career satisfaction for job security. But that security is illusory, as the nature of work is being revolutionized by global and technological forces. Adam’s book provides a practical roadmap for navigating the new economy and gaining the key understanding that a fulfilling career based on self-knowledge is our only true security in a fast-changing world. ~ Charles Hugh Smith, proprietor of oftwominds.com and author of Why Things Are Falling Apart and What We Can Do About It. This book was written for anybody wishing for a different course than the one they're currently on. But we pushed to launch it now as it has special relevance to those deciding for the first time which professional path to focus on: recent high school and college graduates. In particular, the self-discovery and visioning exercises are particularly valuable for these readers, as they are at a life stage when making the right decisions can literally save them from years (even decades) of dissatisfaction. If there's a recent grad in your life whom you think would benefit from this book, please let them know about it.